The fiesta just got a little more seasonal! Squash can be versatile and used in many different ways— especially since there are different kinds of squash that have their own unique tastes and textures. 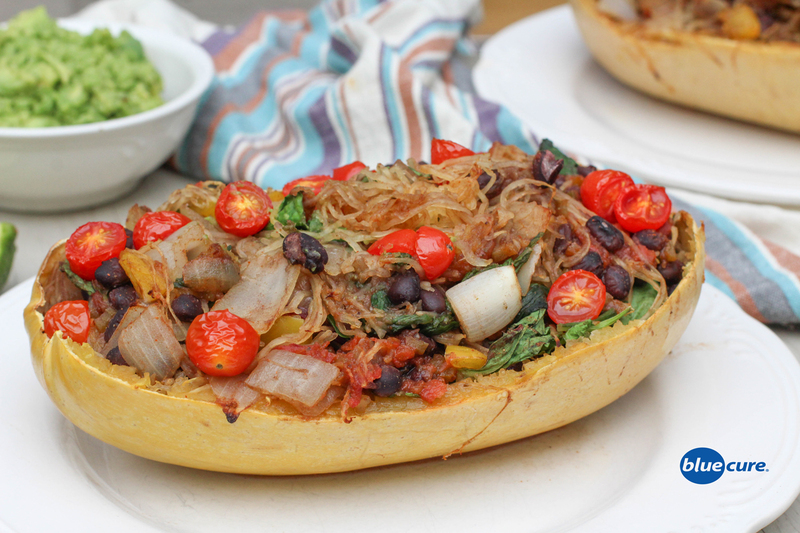 This recipe uses spaghetti squash, a squash with the texture like angel hair pasta. It’s seasoned like a taco with salsa, avocado, and beans. Top it off with dairy-free cheese or nutritional yeast, if desired– otherwise it’s great with just salsa and avocado to jazz up this fiesta spaghetti squash boat! Preheat the oven to 375F. Wash the veggies. Drain and rinse the beans. Cut the squash in half, lengthwise and remove the seeds with a spoon. Place the squash on a pan with edges and pour about 1/2 cup water on the bottom. Cook the squash for 30-40 minutes or until the flesh is soft. Allow the squash to cool for a few minutes, then using a fork scrape the flesh surface lengthwise to create spaghetti. Don’t discard the squash shells. While the squash is cooking, chop the veggies. Sauté the onion with 1-2 Tablespoons of water. Add the peppers and continue to sauté. Finally, add in the spices and greens. Remove the veggies from the heat. In a large bowl, stir together the beans, tomatoes, 1/4- 1/2 cup of salsa, spaghetti squash, and veggies. Then place back into shells. If using nutritional yeast or dairy free cheese, top the squash with the cheese or yeast. Bake for another 15 minutes. In a small bowl, mash the avocado. Add lime juice and pepper, to taste. Scoop the fiesta spaghetti on plates. Add additional salsa, if desired. Top with avocado and enjoy!